At the grand old age of three and a half, my girls had never sat on a bike. They certainly couldn’t use pedals even on one of the sit down type trikes and so I presumed they were just not ready for a bike. However, over the last month or so, as the weather has improved, I’d noticed lots of similar aged children on bikes when we were out an about. As a child, I loved cycling and so wondered whether maybe we should just give it a go. I started to look into toddler bikes. We had two options. 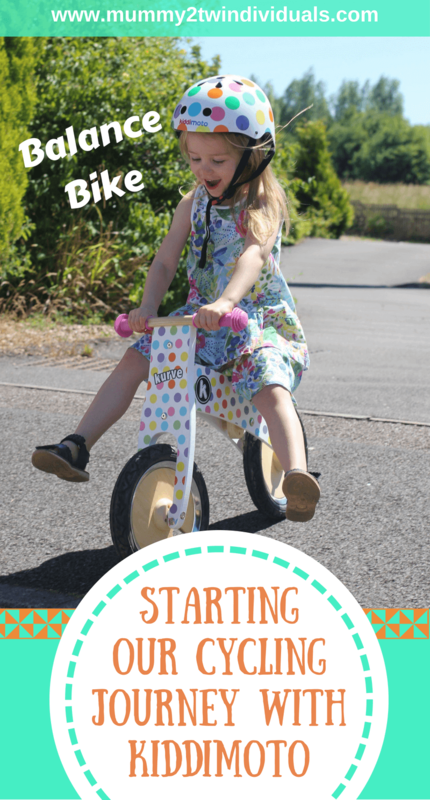 A traditional starter bike with stabilisers or a balance bike. After a bit of research and considering they can’t use pedals anyway, I decided a balance bike was out best bet. 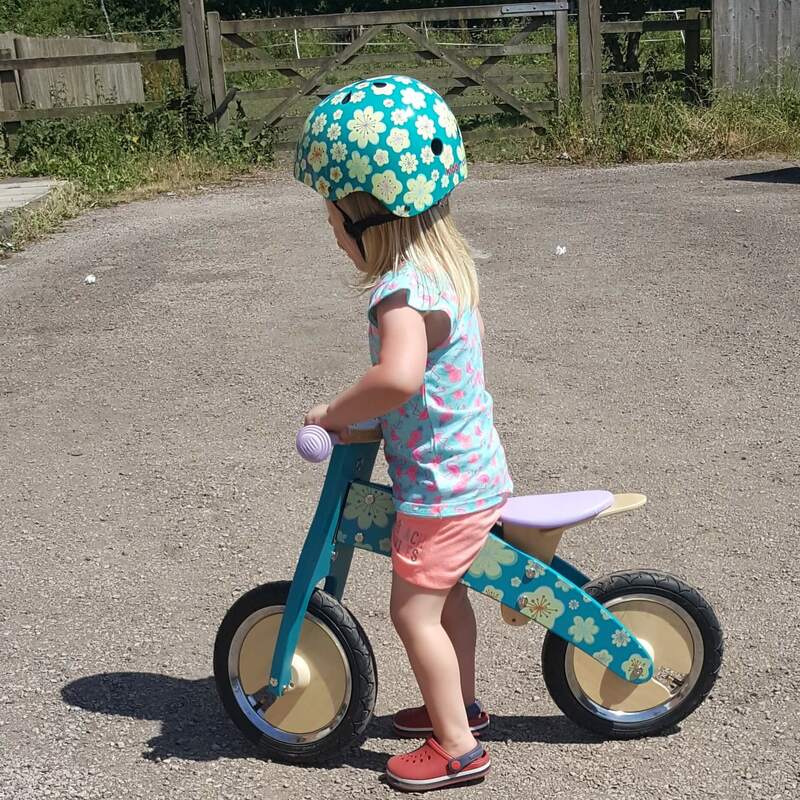 There are lots of companies out there now offering balance bikes but I was quickly drawn to Kiddimoto for their sturdy award winning bikes and fun designs that I knew the girls and I would love. 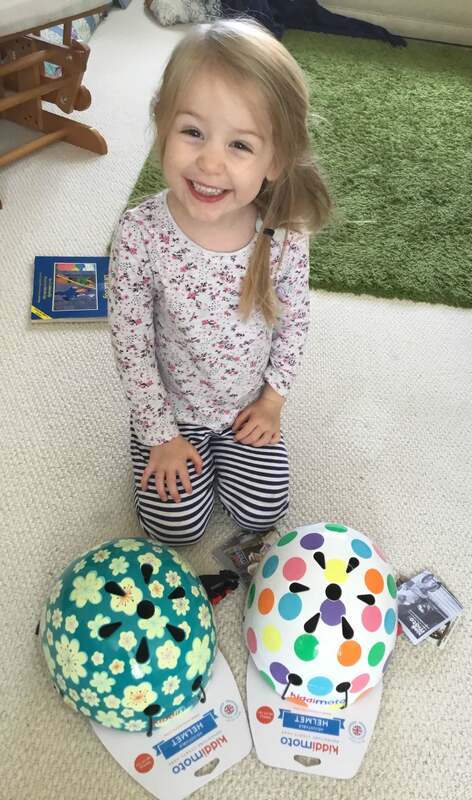 We opted for the Fleur and Pastel Dotty wooden balance bikes and matching helmets. The bikes took less than 15 minutes to put together and the girls were away. Nannie and Popa got roped into helping but I it really wasn’t very tricky. The bikes are designed for 3-5 year old but it is also important to consider your child’s height. 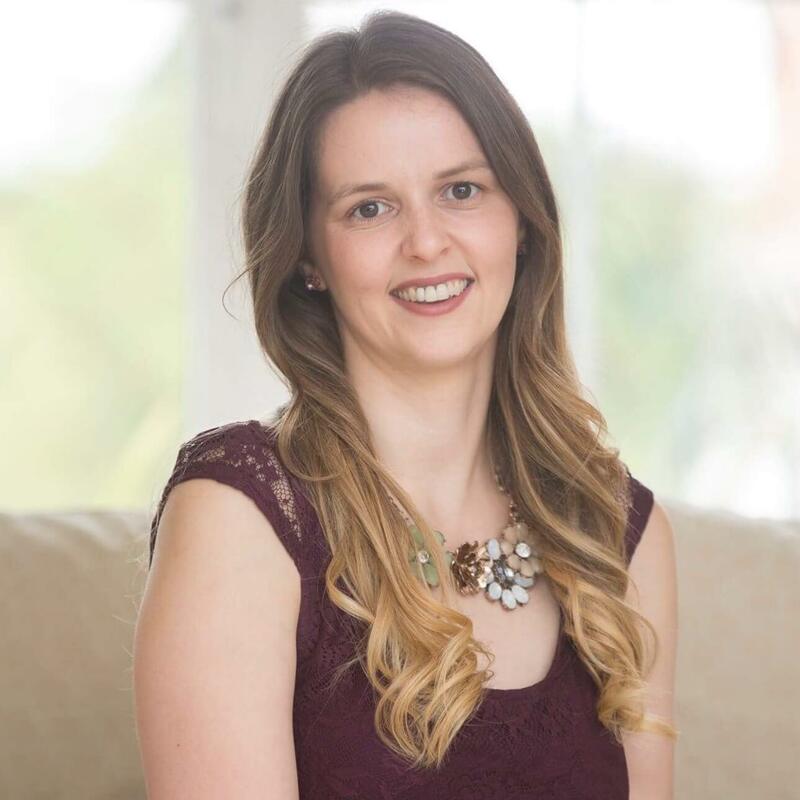 Jessica is 103cm and can place her feet flat on the ground which is recommended when toddlers start to ride. However, Emily who is on the shorter side at 93cm needs to tiptoe even on the lowest setting. Yet it is Emily who is hooked. Even indoors, Emily will request her helmet on and walk her new bike around the kitchen table. She has learnt how to tilt the bike towards her to swing her leg over and is gaining confidence everyday. Jessica, whose bike is the perfect size for her, has started to take long strides and even begun to glide a little with her bike. The idea with a balance bike is that they master the skills of balance, steering and control before you introduce pedalling. I absolutely love them. They are exactly what I wanted for the girls. The wooden bright designs are beautiful and Kiddimoto also do a range of metal balance bikes too that are just as fun. I’m really pleased we opted for a balance bike instead of a bike with stabilisers. Instead of just allowing my girls to walk or push themselves along, I can imagine needing to teach them to pedal. Once they’d figured that, I think I’d need to reteach this skill whilst also learning to balance. I can’t wait to get a bit more practise with their new bikes. We’ll take them to the park and around our local reservoir. My car boot is modest and yet these both fit comfortably so there is no excuse. Now the sun is finally shining, what better way to get about than to glide along on a super snazzy new bike? If only they made one in my size. Later in the year, I’ll be following up to see whether the balance bikes have lived up to my initial excitement. I’ll also review whether I believe they are really preparing them for the transition to a pedal bike. Stay tuned for that. 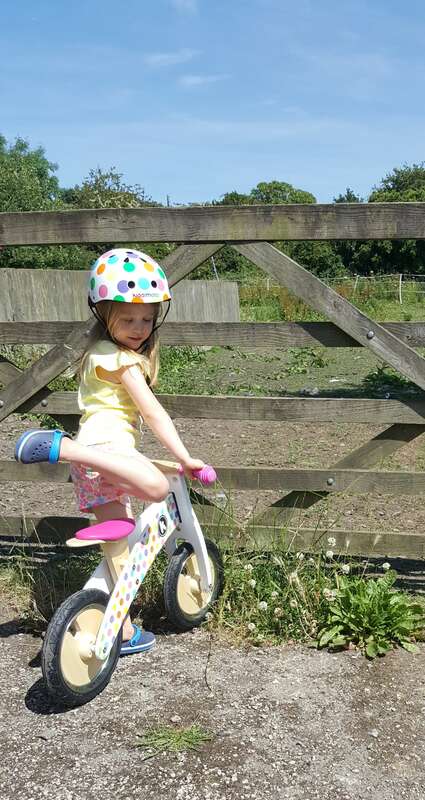 Bike with stabilisers or balance bike…what do you think is best for a first bike? We were gifted these bikes for the purpose of this article but all opinions are my own.